Traverse the engineering feat of a lifetime through the Panama Canal, stop in fun spots all across Central and South America, and lap up the luxury onboard with comfortable beds and extensive amenities. The Sirena is a recently renovated cruise ship by Oceania Cruises and journeys to the Mediterranean, Caribbean, the Panama Canal and just recently, Cuba. 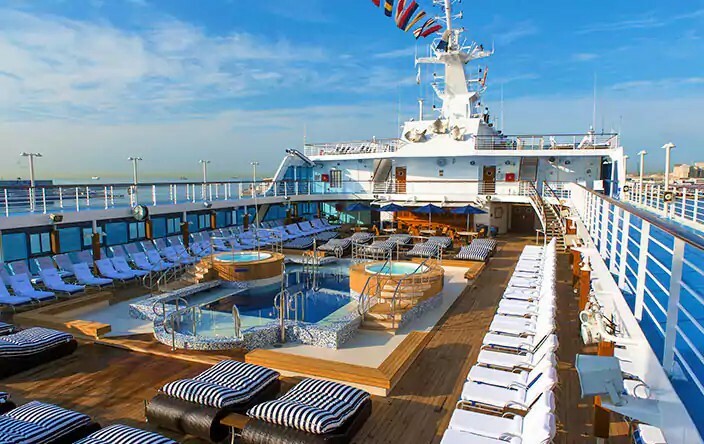 This ship, formerly known as the Ocean Princess and now a sister ship to the Regatta, Insignia, and Nautica, underwent a major redesign in 2016 with updates to her 342 luxurious staterooms and suites. Sirena offers two fresh culinary experiences to continue Oceania's reputation for providing "the finest cuisine at sea." The Tuscan Steak is a specialty Italian restaurant serving succulent steaks and fresh seafood, and the new Jacques Bistro makes its debut in the Grand Dining Room at lunchtime. The mid-size Sirena has an incredible staff to guest ratio of 1.71 to 1, and the personalized service from butlers, room attendants, waitstaff, and sommeliers is nothing short of spectacular. Every guest is pampered and treasured. For entertainment, you can't beat the Sirena's array of onboard delights, starting with locally inspired music sets and colorful folkloric shows. Dance music, sing along venues and the Cabaret Cinema will keep your toes tapping. For sunny days, there is a large heated pool and two whirlpool spas along with luxurious day beds for a relaxing dday with beautiful views of the ocean. Explore your cabin options on the Sirena, from the luxurious Owner’s Suites to the budget-friendly Inside Staterooms. Inside Staterooms are perfect for the budget traveller with 160 sq ft of comfort and style. These cabins include a comfortable seating area, vanity desk, refrigerated mini-bar and plenty of storage. Ocean View Stateroom is a comfortable cabin including a comfortable seating area with a sofa, a vanity desk, breakfast table and refrigerated mini-bar. Veranda Stateroom includes 216 sq ft, a private teak veranda, a vanity desk, refrigerated mini-bar, a breakfast table, and a spacious seating area. Size: 323 to 1,000 sq. ft. Owner's Suite is the most spacious and luxurious cabin with nearly 1,000 sq. ft. of living space. It includes a bathroom with oversized shower, a private teak veranda and more. The Sirena is a great ship when you want to see the world and enjoy the amenities of an upscale cruise. Designed to make you feel at home, this ship has many entertainment options like musical performances, a Monte Carlo-style casino, the Horizons nightclub, and dance lessons. So sit back and relax as you make new friends, learn about new places in the world, and have an unforgettable adventure. The stimulating variety of entertainment options onboard focuses on the cultural exchange that happens with all travel. The Sirena and her sister ships provide interesting guest lectures by historians and naturalists eager to share their knowledge. Relax at a musical performance featuring a live pianist, a classical string quartet, a dynamic vocalist, or a spectacular headliner. Later, try your luck at the elegant Monte Carlo-style casino or go dancing at Horizons. As charming as this ship is, you'll want to venture onshore to see the lands you are visiting. Shore excursions are an important part of your cruise and several are offered aboard each cruise so be sure to ask about availability and pricing before you board the Sirena. 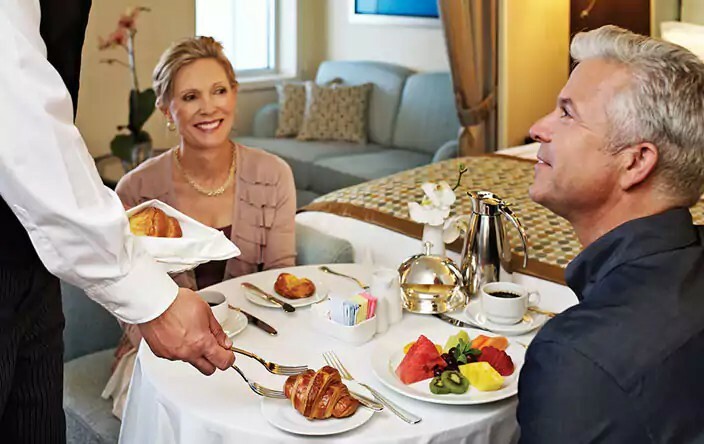 When you’re sailing on the Sirena, you’ll find a restaurant for every craving. Enjoy the delicacies you dream of with a variety of cuisines and options. The Grand Dining Room-Open for breakfast, lunch, and dinner featuring European-inspired cuisine and Canyon Ranch signature dishes. The menu changes daily, so you’ll never get bored. Red Ginger-Contemporary interpretations of classic Asian dishes with incredible flavors. Tuscan Steak-Specialty restaurant with an elegant exterior. This steakhouse is a modern take on tradition and features a diverse and innovative dinner menu. Terrace Café-Dine inside or al fresco on a series of different menus featuring pizza, lobster, or sashimi, and give your tastebuds a treat. Waves Grill-Gourmet burgers, fresh seafood, and decadent desserts. Baristas-Espressos, cappuccinos and lattes prepared by master baristas, as well as the delicious pastries, finger sandwiches and homemade biscotti. Afternoon Tea-Bountiful four-tiered pastry carts filled with freshly made finger sandwiches, colorful petits fours, richly textured scones with clotted cream, and wonderfully sinful desserts with a selection of premium teas.